Stunning 90% Silver Kennedy Half Dollar Proofs Struck in San Francisco! Born out of immense tragedy, the John F. Kennedy Half Dollar was created out of a need to help a wounded country to heal. Pulled together quickly, but not in haste, the fact that this inspiring tribute to the 35th President of the United States still endures today is a testament to the care and craft of the United States Mint's artisans. Through the optimistic smile and focused gaze of JFK, the hope and optimism of his time in office is immortalized for future generations. 2017 marks both the 100th anniversary of John F. Kennedy's birth as well as the 225th anniversary of the United States Mint. 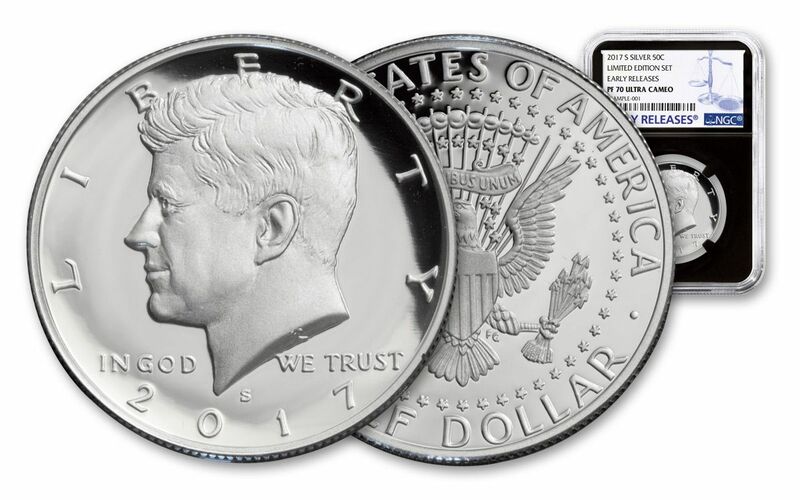 As a way to commemorate both, we've hand-selected a number of 2017 Kennedy Half Dollars from the year's Limited Edition Silver Proof Sets for grading by Numismatic Guaranty Corporation (NGC). As a result, we have a brilliant reserve of flawless proofs that are ready for your collection! LASTING, REVERENT DESIGN-- With Gilroy Roberts' artful profile of John F. Kennedy on the obverse and Frank Gasparro's presidential coat of arms on the reverse, this tribute is still as striking as it was when it was unveiled in 1964. MINTED IN "THE CITY BY THE BAY"-- Minted by the acclaimed staff at the San Francisco Mint, each half dollar begins as a hand-selected planchet of 90% pure silver. Then, through multiple strikes from polished dies, each blank is transformed into a proof rich with distinct, frosted details that hover over mirrored surfaces -- all crowned with an "S" mint mark. 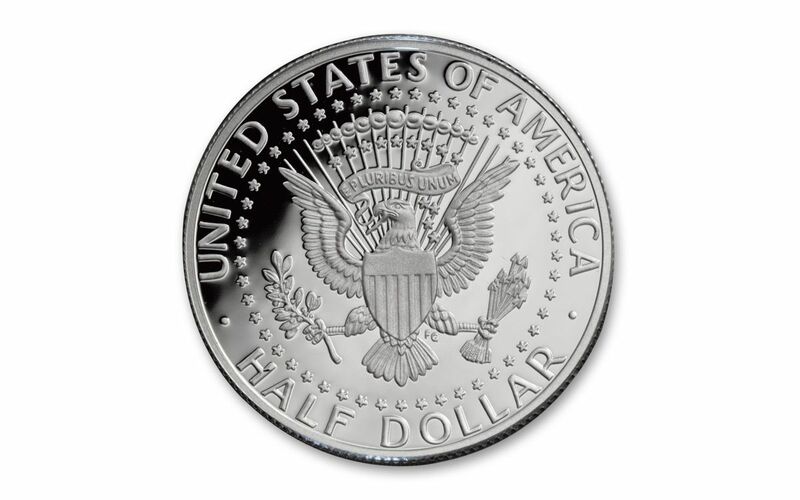 UNITED STATES LEGAL TENDER-- Each 2017 Silver Kennedy Half Dollar Proof is fifty cents legal tender -- a true piece of United States coinage. 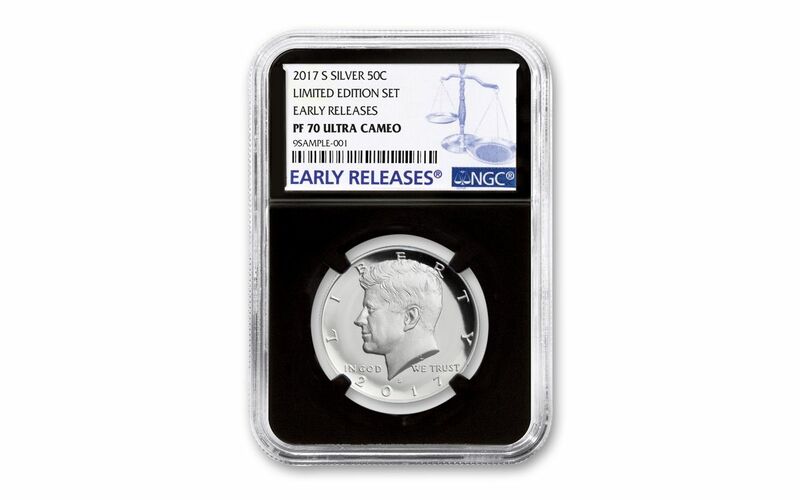 CERTIFIED FLAWLESS-- Your coin will also come certified Proof-70 Ultra Cameo (PF70 UC) by NGC, a distinction that means your perfectly-graded 2017 Silver Kennedy Half Dollar Proof will have ZERO imperfections -- showing all features and fields exactly as the engraver and mint intended. In addition, your Kennedy Half Dollar Proof will be certified both Limited Edition Set and Early Releases (ER) by NGC, meaning that it was originally part of the U.S. Mint's 2017 Limited Edition Silver Proof Set, was among the first struck by the mint and was verified within the first 30 days of issue. Finally, your coin will be sonically sealed in an acrylic case with a black display core, giving you the best in protection while granting clear sightlines into every beautiful detail. AN EXTREMELY LIMITED RELEASE -- Only 50,000 U.S. Mint Limited Edition Silver Sets will be created for 2017. These Silver Kennedy Half Dollar Proofs will be among the select few that showcase the distinction of Limited Edition Set by NGC. For a historic coin that carries the date of two important anniversaries, we're expecting the demand for this 2017 Silver Kennedy Half Dollar Proof to be extremely high. For fans of American history and coin collectors alike, this flawless proof makes both a perfect collection addition and an ideal gift. Don't wait for this opportunity to pass -- order yours now!